The Connecticut Department of Transportation released a study Nov. 14 which stated that electronic tolls posted on highways throughout the state could raise nearly $1 billion a year, but the study comes at a time when a tolling program underway in neighboring Rhode Island faces a court challenge. The purpose of the Connecticut tolling plan would be to direct money into the Special Transportation Fund, which is used to finance highway and infrastructure improvements. Connecticut hasn’t had tolls in place since the late 1980s. The analysis presents a hypothetical toll system that minimizes the cost of collection and establishes the same rates per mile on all toll roads. Although tolls in the scenario are collected from in-state and out-of-state drivers, rates are lower for Connecticut-based drivers. All 82 potential tolling gantries would be electronic and payment would be collected by E-ZPass devices, internet or mail, depending on whether a driver has E-ZPass. The hypothetical toll rates vary based on vehicle type and registration. A Connecticut-based driver with a “commuter discount” would be charged less than, for example, an out-of-state driver in a vehicle whose plate is not registered with the state’s tolling system. An unregistered plate would require a Department of Motor Vehicles lookup within Connecticut’s database of vehicles or databases of other states to enable invoicing and payment collection. Drivers also could choose to pre-register their vehicles with the toll system and authorize direct payment from their bank accounts. In CTDOT’s scenario, an out-of-state heavy-truck driver with an E-ZPass would be charged 31.6 cents per mile during peak hours. A heavy truck with an unregistered plate would be charged 47.2 cents per mile during peak periods. The potential tolling system would affect all interstate highways in Connecticut — interstates 95, 84, 91, 395, 691 and 291. It also would encompass four other important highways — state routes 15, 8, 2 and 9. The study mentions that Connecticut’s potential toll rates would be less than some of the fees exacted on other tolls routes on the East Coast, such as the Pocahontas Parkway in Virginia and the Delaware Turnpike. 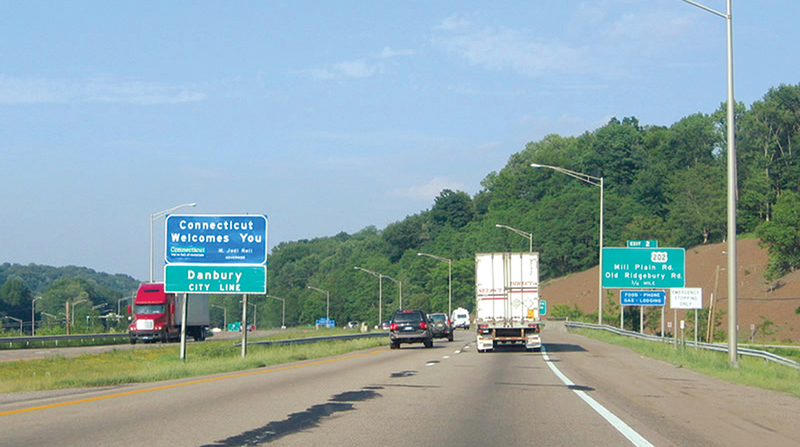 The key difference between Connecticut’s hypothetical tolls and other states’ tolls is that neighboring states don’t have gantries posted on every interstate, according to Motor Transport Association of Connecticut President Joe Sculley. The study estimates that 40% of total revenue would come from out-of-state drivers. About 46% of the revenue from trucks would come from out-of-state trucks. Connecticut voters approved an amendment to create a lockbox for transportation funds Nov. 6. The measure would ensure transportation revenue is used only for transportation-related purposes. The report stated that the tolling plan could generate revenue to fund highway projects. For example, widening projects on I-95 and I-84 could save time for travelers. The report notes that the average commuter traversing I-95 West would save 29 hours per year by 2040 if such widening efforts were carried out. Although CTDOT’s study considers tolling both cars and trucks, Gov.-elect Ned Lamont has pledged to toll only trucks. Connecticut’s neighbor to the east, Rhode Island, is home to truck-only tolls. The state made two (of an eventual 13) truck-tolling gantries operational on June 11 in Hopkinton and Exeter, which toe the Connecticut border. Rhode Island’s truck tolls have stoked the ire of the trucking community. A lawsuit filed July 10 by American Trucking Associations, Cumberland Farms Inc., M&M Transport Services Inc. and New England Motor Freight contests the constitutionality of the truck-only tolls on grounds the levy discriminates against interstate commerce. Sculley, also an opponent of truck-only tolls, said state leaders should refrain from even considering such tolls until ATA’s lawsuit reaches a conclusion. “I don’t know why Connecticut would try and make some kind of risky decision that could result in them wasting time and money until [they] know the outcome of the Rhode Island lawsuit,” Sculley said.